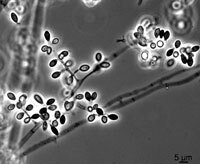 Neosartorya species are thermophilic sexual stages of Aspergillus species and several species have been associated with human infection. We described the first case of infection caused by Neosartorya laciniosa involving invasive sinusitis in an immunocompromised male with aplastic anemia. The fungus invaded the eye orbit and treatment required surgical debridement with enucleation of the eye and a combination of voriconazole and micafungin therapy followed by voriconazole alone. The isolated fungus was identified as N. laciniosa using sequencing of partial benA and calmodulin genes. N. laciniosa UAMH 11627 showing hyphae in tissue of patient (left), culture on PDA after 7 days at 35C (middle), and ascospores (right) observed by differential interference contrast (DIC) microscopy. Scopulariopsis and Microascus species are common and widely occurring fungi that are uncommonly involved in human infection. Infections are usually cutaneous, primarily involving the nails, and sometimes the skin. 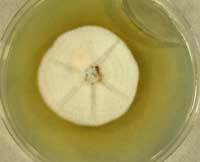 Repeat culture of the fungus and evidence of the fungus in the specimen is required to confirm cutaneous infection. Scopulariopsis brevicaulis is the most common agent of infection. Invasive infections are very rare. A 2012 report described a rare case of fatal disease in an immunosuppressed patient following chemotherapy and stem cell transplant and reviewed 32 cases of confirmed invasive Scopulariopsis or Microascus infection. Geosmithia argillacea (recently renamed Rasamsonia argillacea) in patients was reported from seven cases of invasive infection in patients with chronic granulomatous disease. The patients responded poorly to treatment and three died. This fungus has been confused previously with Paecilomyces variotii. In these cases, both cultural morphology and molecular data were used to identify the fungal isolates. R. argillacea is now increasingly recognized as an important causative agent of pneumonia and invasive infections in CGD patients. 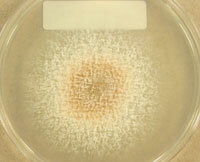 Myceliophthora thermophila is a thermophilic mold commonly found in silage, wood chips or soil. There are rare reports of human infection. A case of invasive iinfection mimicking aspergillosis was diagnosed in an immunocompromised patient in France. Repeated samples were positive in the galactomannan (GM) assay, a test useful in the diagnosis of Aspergillus infections. M. thermophila was isolated from the patient and shown to also produce a positive result in the GM assay.This cases demonstrates the importance of culture for correct diagnosis of infection. Metarhizium anisopliae is a cosmopolitan insect pathogen rarely associated with human or animal disease. We described a case of severe pneumonia in an American alligator. M. anisopliae was isolated in culture and identified by ITS sequencing. 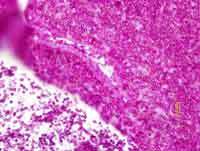 An unusual presentation was the heavy sporulation of the fungus in lung tissue that allowed for presumptive identification of the fungus as Metarhizium. A second unusual finding was the production of calcium oxalate crystals in the lung. The crystals were also produced in culture by the fungus. Image (L) showing alligator lung tissue stained with PAS showing conidia and hyphae (courtesy Dr. K.W. Conley); (R) showing Metarhizium anisopliae UAMH 11138 isolated from alligator lung. Macrophomina phaseolina, a plant pathogen, was reported for the first time as the cause of disseminated infection in a Canadian man, originally from Sri Lanka, who received a renal tranplant in India. The patient subsequently succumbed to invasive infection with a different but related fungus, Neoscytalidium dimidiatum (formerly Scytalidium dimidiatum). Molecular data confirmed the identification of both fungi and revealed that they are related species within the ascomycete family Botryosphaeriaceae. Mycoleptodiscus indicus, a fungus found in tropical or sub-tropical regions, caused septic arthritis of the knee in an otherwise healthy Canadian male. The fungal infection was diagnosed in Canada but thought to have been contracted while the patient vacationed in Costa Rica, probably through direct inoculation through injured skin. 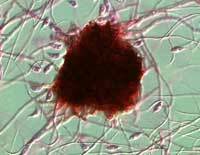 The fungus was isolated from synovial fluid and identification was confirmed by DNA sequencing. Another case of Mycoleptodiscus sp. infection published in 2012 involved an immunocompromised patient who experienced necrotizing cellulitis and mycositis in the leg. Graphium basitruncatum, a fungus known previously from soil in Solomon Is. and Japan, was reported as the cause of fungemia in an immunocompromised patient from Canada. The fungus was isolated repeatedly from blood cultures and it spread to the skin, resulting in necrotic skin ulcers.